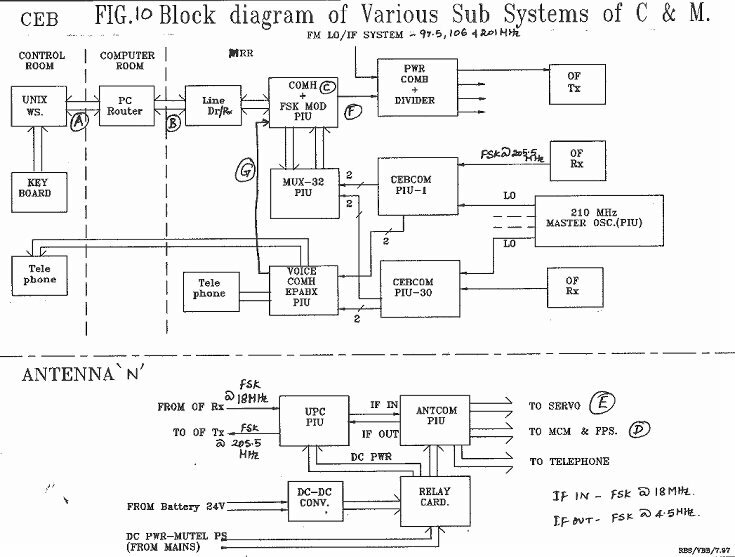 So for, You have been exposed to the functions of C & M system,various data rates used by the system and the type of modulation used etc.But how all these things are achieved ? 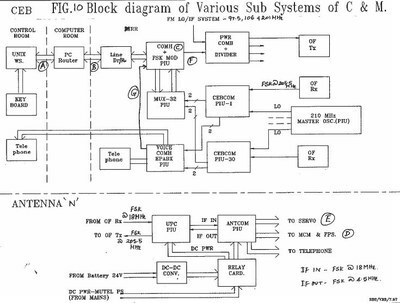 This system block diagram will give you a clear idea of the inner workings of the C & M system and the signal flow thro' the various subsystems. Already you have seen the operation and command flow of the ONLINE system.But this block diagram will give you an idea of the data flow and how the various data rates are used.User commands for various antennas are processed by UNIX WS and sent to the COMH thro' the PC router.The PC router acts as a buffer and accepts the TCP/IP data @ 10 Mbits/sec(Link A),strips the TCP/IP headers and sent it as asynchronous data with the headers to COMH @ 38.4 Kbits/sec.This RS232-C link (Link B) is converted to RS 422 signals (differential TTL signals) and vice-versa. CEB ----- CENTRAL ELECTRONICS BUILDING. The ANTCOM is the brain behind the operations in each and every antenna shell and services all the relevant peripherals in a cycle time of 1 second. ANTCOM has got the same circuitry as COMH and handles one more serial communication - ANTCOM - MCM communication using INTEL 82510 Communication Controller @ 9.6 Kbits/sec in addition to other two serial communications(125 Kbits/sec SDLC/HDLC data and 9.6 Kbits/sec SERVO data). Now, we'll see how (ANTCOM) reassembles the data sent by UNIX WS/COMH. 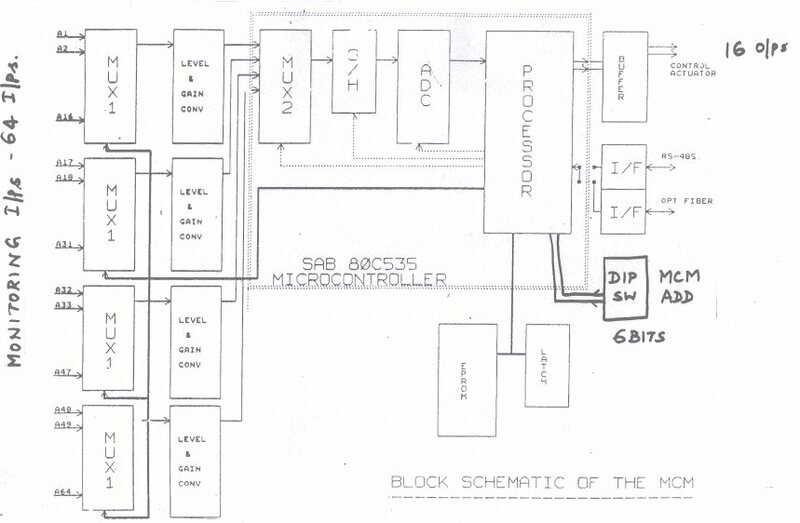 Next,we'll see the block diagram of MCM circuit and discuss. So for , I have mentioned about VOICE COMMUNICATION.Let us see how the analog voice is digitized and combined with the rest of the data and the functions of Telephone signalling etc. We have been talking about various subsystems of C & M and discussing the salient features etc It was mentioned somewhere in the talk that the C & M system can take of any errors occurring in the transmission /reception path and detect it. How ERROR DETECTION is achieved ? Finally,we must know the STATUS OF THE C & M system and its performance.